Examples, solutions, videos, worksheets, stories, and songs to help Grade 7 students learn about reflection in geometry. In this lesson, we will learn about reflection. A reflection (or flip) is one kind of transformation. The reflection of a point is another point on the other side of a line of symmetry. Both the point and its reflection are the same distance from the line. 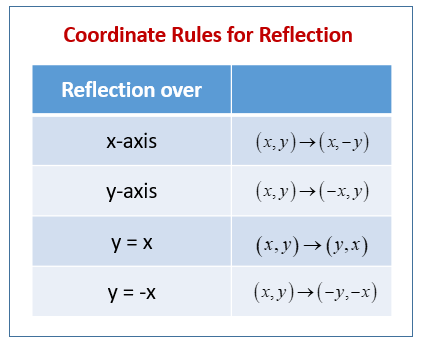 The following diagram show the coordinate rules for reflection over the x-axis, y-axis, the line y = x and the line y = -x. Scroll down the page for more examples and solutions of reflection on the coordinate plane. Explains what the coordinate rules are for reflections on a coordinate grid, and it shows where these rules come from by looking at examples on graphs. Reflections over the y-axis, x-axis, and the line y = x are shown. Review the rules for performing a reflection across an axis.